First of all, Lilian Magill – super-awesome genie lady! Lilian took me under her wing for Congress and introduced me to so many wonderful people. My last Congress was a very lonely affair. I had only just started blogging and knew no-one. I just attended sessions, struck up one or two conversations and went home. It felt very isolating and lonely. However, Lilian’s kindness and generosity ensured that I was not left friendless and forsaken. Thank you, Lilian! There were lots of opportunities for social hobnobbing including pre-Congress dinner at Pancakes at the Rocks, the official Welcome Function followed by the unofficial get-together at the Harbourside food court next door, Congress Dinner, casual lunches and dinner get-togethers with new acquaintances, and so it went on. 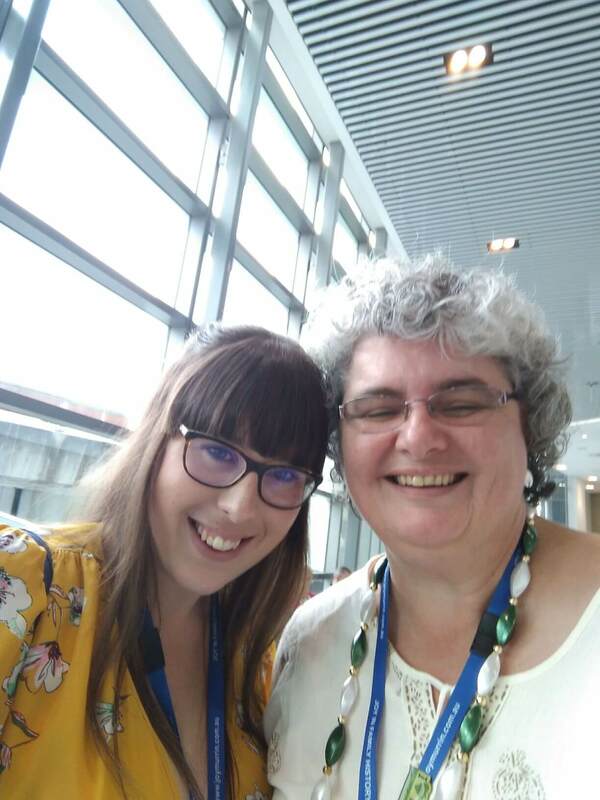 Here I am taking my very first selfie with the lovely Emily Peace (Diary of a Young Genealogist)! Congress was full of opportunities to meet wonderful genies. I woke up every morning exhausted from the social whirl! But it was so terrific to meet new people and put faces to names of people I’ve chatted with in Facebook groups. And best of all was how friendly, welcoming and inclusive everybody was. From my point of view, Jill Ball’s wish to have this Congress be known as the Friendly Congress was well and truly achieved. 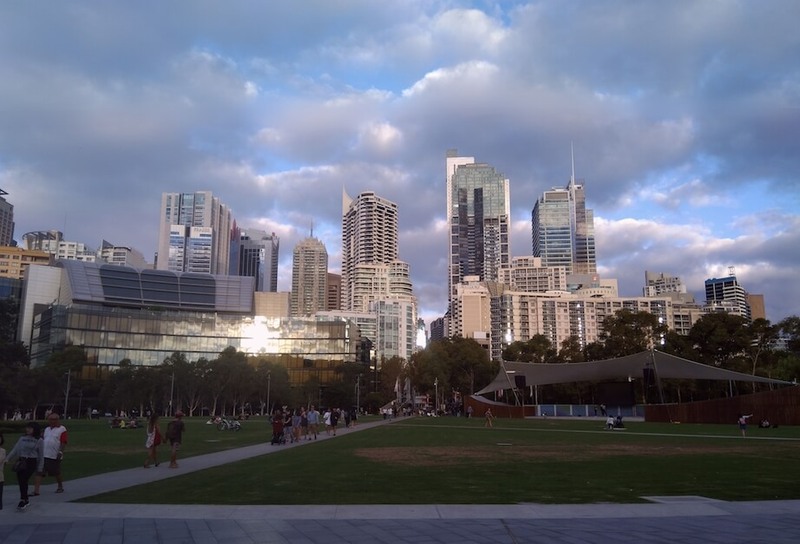 Sydney putting on a show – lovely weather every day! But what about Congress itself? Did I actually attend any sessions? You bet. But there were so many to choose from that a complaint I heard constantly from others was the struggle to choose which session to attend. There were too many interesting sessions, so I chose to focus on sessions that would help me with areas of my research that I was currently either struggling with, or covered areas of interest that I constantly run across in my research. I attended sessions covering topics on Irish, German and London research, non-conformists, writing stories, tarting up your blog, various technologies of interest (e.g. GEDmatch, Google Earth, visualisation technologies), and, of course, Judy G. Russell’s sessions on “Copyright and Copywrongs” and “The Language of the Law”. Judy is a wonderful speaker who can make even the most impenetrable subjects comprehensible and fascinating. If you ever get the chance to hear her speak – grab it! You won’t be disappointed. But it was Judy’s plenary talk that I found most thought provoking and had what I think was probably the most important message in the entire Congress. Family memories, stories, facts can all be lost…in Just Three Generations. That message hit me right in the head and the heart. It is so easy to get lost down research rabbit holes, chasing those Bright Shiny Objects – and meanwhile the research is just piling up. It is just as important to share that research and those stories – share as widely and as often as possible so the stories are not lost and gone forever. Be brave on the page – say what hasn’t been said before. Tell their stories. Take them home. Be brave on the page – what an important reminder. So often we play it safe. Why not show more emotion and heart when writing down our family stories? Surely our ancestors deserve more from us than just dry facts, dates and places? Complementing Jan’s message is Pauleen’s message which was tucked in at the end of her presentation. 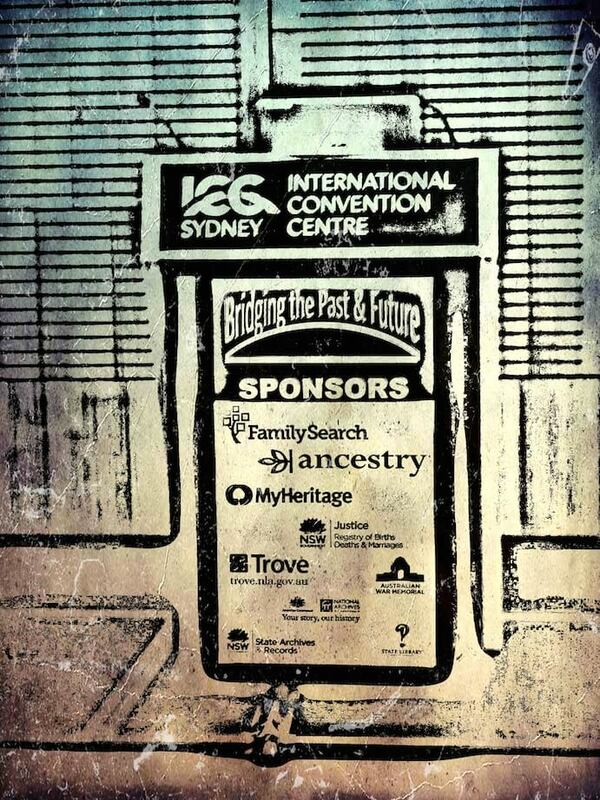 When I saw the words, it suddenly seemed so clear why we do what we do as family historians. By serving as the family historian, we are truly bridging past and future by documenting and passing on our family stories – not only deliberately and accurately, but with heart, gratitude and passion. And we do this not only to discover more about ourselves but to acknowledge, understand and remember our ancestors so we can, finally, take them home. 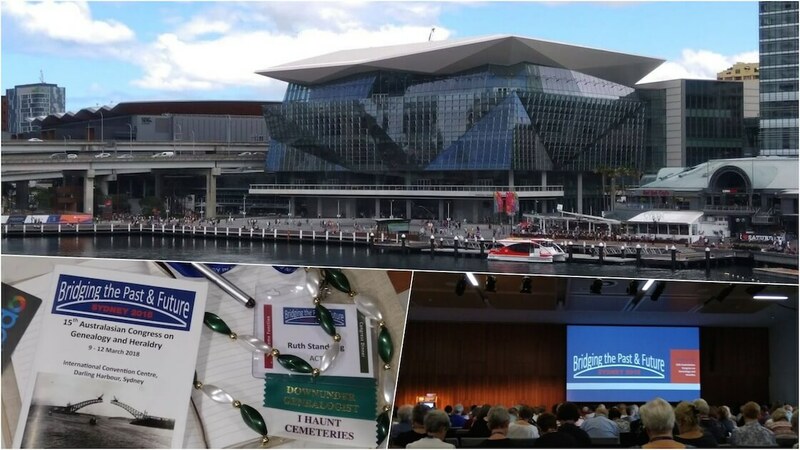 This entry was posted in AFFHO, Congress2018, Genealogy and tagged AFFHO, Australia, Congress_2018, Family History, Genealogy, Sydney. Bookmark the permalink. Congratulations on a great post Ruth. I look forward to reading more of them in the future. Thank you so much for the mention Ruth…I’m pleased the message resonated for you. I love your synopsis of why we do what we do so passionately. Thanks, Pauleen! Your presentation was brilliant! I’ve always felt a little lost with my husband’s Irish ancestors – never sure where to take them next. Believe it or not, I’ve never heard of chain migration before and hadn’t thought of checking for friends emigrating as well as relatives. Lots to do now! So pleased you found it helpful…Irish Research keeps us on our toes. Also love the photographic effect of the lectern. Thanks, Pauleen. Carmel Galvin and her post on image manipulation for blogs is my inspiration! (http://librarycurrants.blogspot.com.au/2017/06/picture-this.html) It certainly turned a boring, slightly blurry photo into something interesting and useful. Carmel is so clever with technology!! I shall have to try that trick with pics. I too was impressed by the ease of mingling and making new friends at this Congress. SAG has set a good example for other organisers to follow. I hope to see you at future events Ruth. Thanks, Gayle. It was lovely meeting you at Congress. Hope to see you again at other events, too! So pleased you found friendship at #Congress_2018. Thanks for your insightful post Ruth. 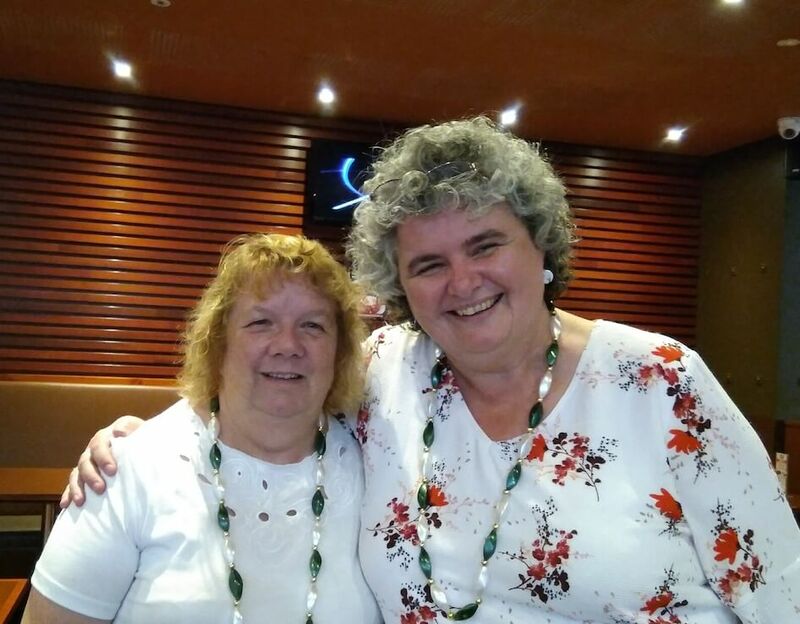 It was wonderful to catch up Ruth, and great to have the extra non-Congress events which helps to get to know people a little better. And thankyou for your post, I loved reading what you went to and learnt. Thank you, Alona! It was great meeting you!